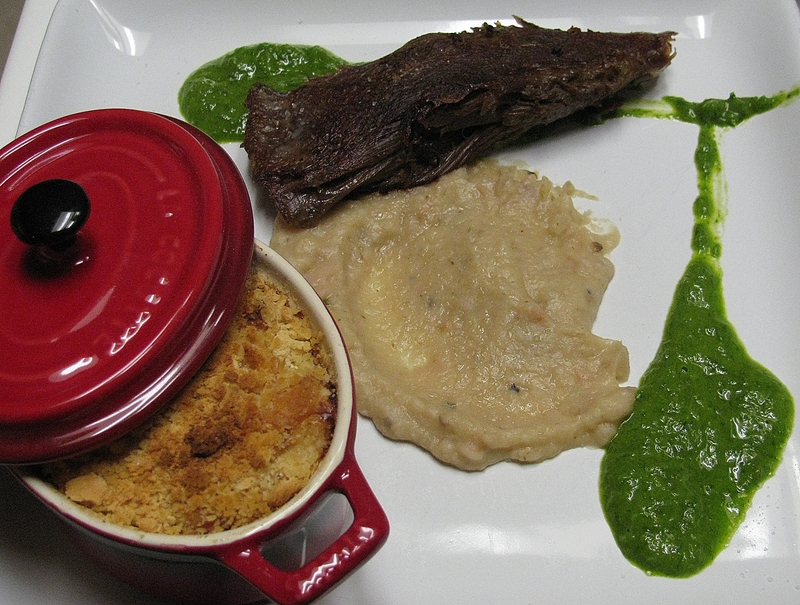 The whole reason this dish came together are those neat looking Cocottes, the small red ceramic dishes. Diana, always keeping an eye for good deals, picked them up as a Christmas present for me at Tuesday Morning for a good price. I knew I would be using these things as soon as I possibly could. As luck would have it, I had some cooked and vacuum packed confit of venison shoulder on hand. To do that, I had used one of the deer shoulders from a deer my neighbor gave me and cured it as I would do duck confit using shallots, salt, rosemary and added juniper berries for good measure. 24 hours later I rinsed and dried the meat then packed it with a little duck fat in a FoodSaver bag. This was then cooked sous vide at 185F (85 C) for several hours. When ready to serve I divided the meat into chunks and seared it in grape seed oil over high heat. To use the the nice little red pots, I prepared a cauliflower gratin. This is an amazing recipe and along with the quiche is the recipe I prepare the most from Thomas Keller’s Bouchon Cookbook. The cauliflower prepared like that is delicious and the highlight of this dish. Sure, the venison was tasty. It’s meat afterall and is cooked in duck fat with herbs. It’s succulent and robust. However, to make a simple cauliflower taste so damn divine is what real cooking is all about. I did deviate a little bit from Keller’s recipe here. I cooked the stems and some of the florets sous vide @ 185F (85 C) for 2 hours until very tender then pureed them. I cooked the rest at the same temperature with some butter and salt in the bag for about 45 minutes until perfectly cooked. 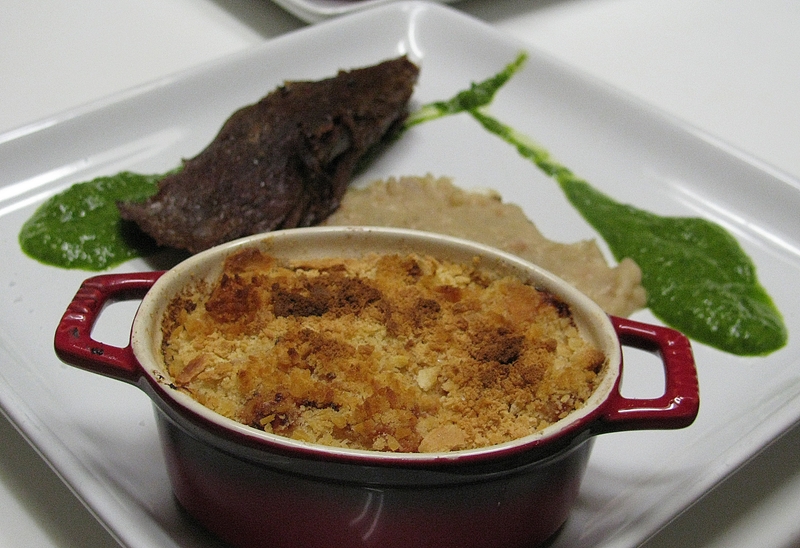 To finish the gratin, the puree is mixed with cream and flavored with shallots and thyme, then mixed with the florets in the small pans and topped with Gruyere cheese and bread crumbs. I baked these until bubbly and the crumbs are golden. 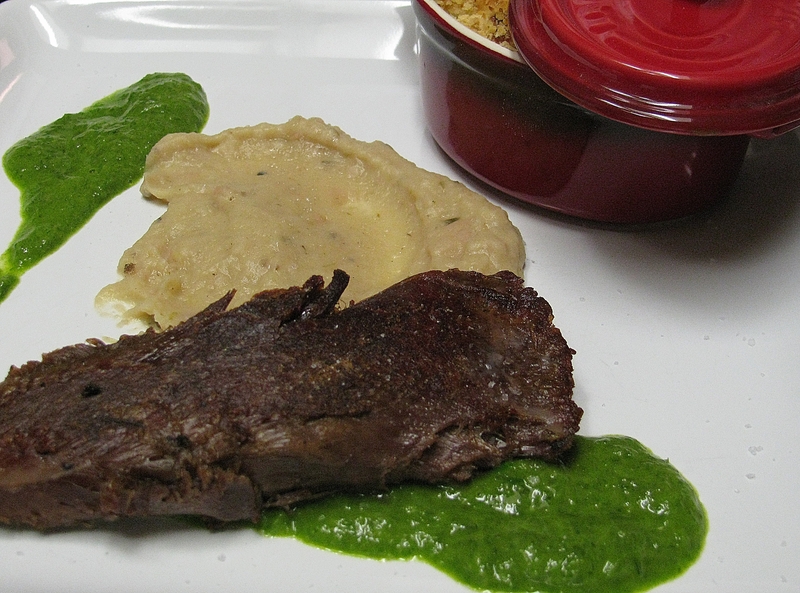 To serve the dish I used a puree of white beans cooked with leeks as a base for the venison. For a sauce I blanched the green pats of a bunch of scallions and pureed it with olive oil and lemon juice.